Token Boards - All Things Special Ed. Need something effect but easy to set up to help with desired school behavior? Token boards are a great positive behavior management system that are easy to set up, easy to travel with from class to class and rewards students for desired behaviors! 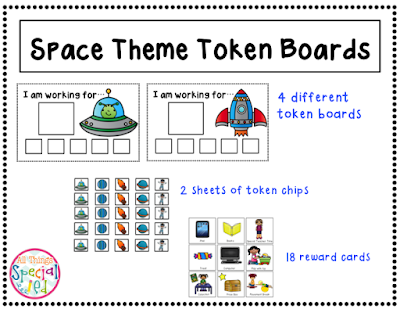 Click on the picture to get your token boards now in my TPT store! Currently I have a student who is picking and choosing the work he wants to do, crawls around no the floor, has hid in the bathroom and even left the classroom! Well it is definitely time to bring in some positive behavior management tools and we have started using token boards. Token boards are easy to set up and are an effective tool to help shape desired behavior in the classroom. When using token boards, students are rewarded for showing desired behavior (sitting in circle time, starting thier work, completing thier work, staying in the classroom, ect.). Token boards can easily travel from classroom to classroom to help your student(s) work toward a reward for displaying desired behavior(s). 1. Place Velcro on the token board, the chips (picture symbols), and reward cards (use the ones included in my packet or simply create and print a picture of desired reward that the student will be motivated by). 2. Talk to the student about earning rewards and showing them what you want them to do. 3. Have the student choose from a list or from picture cards the reward they would like to earn. 3. Every time the student displays the desired behavior, place a token on their board. When the board is filled up, the student gets to have time with their reward choice. I typically set a timer for 5 minutes while they do desired reward. When beginning token boards or any reward system, reward immediately and frequently. When the student starts showing desired behaviors more often and for longer periods of time, you can slowly back off with rewarding immediately and hopefully work towards fading or using for different behaviors.